When cooking was much more seasonal this salad was extremely popular in winter when many other vegetables were unavailable. Using bottled sauerkraut you can make this salad all year around. You can also buy vacuum packed sauerkraut in many Polish shops. 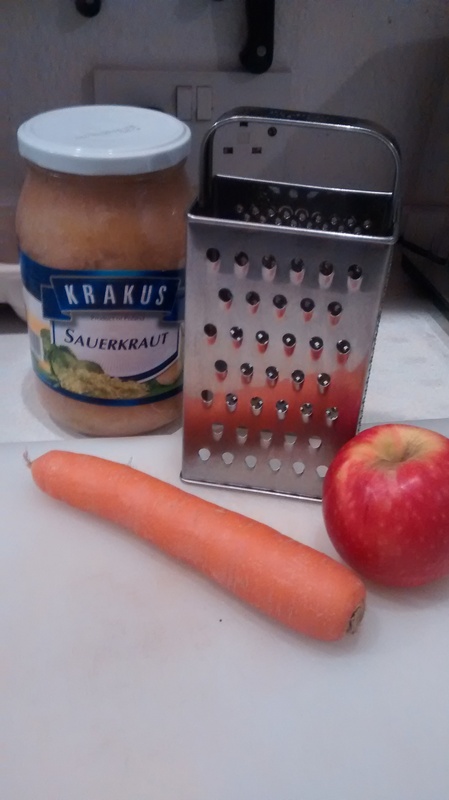 There are two ways of preparing the sauerkraut. It all depends on the actual sauerkraut which varies with the home-made or vacuum packed being milder usually than the bottled & how sour you like it to be. Sour is indeed a well loved taste in Poland and sour is a description you can apply to many Polish dishes. There will be more posts on this on the future. These salads could be considered sweet & sour. For all the following salads I have used roughly 200g of sauerkraut which is easily enough as a side-dish for two people. I think all the following salads benefit from being made a few hours ahead and left to allow the flavours to interact and mellow. Just take some of the sauerkraut and sieve of some of the liquor. Put the sauerkraut into a jug or bowl and add some water to rinse off the liquor. My personal preference is to use method 1 with the sauerkraut just drained and not rinsed. 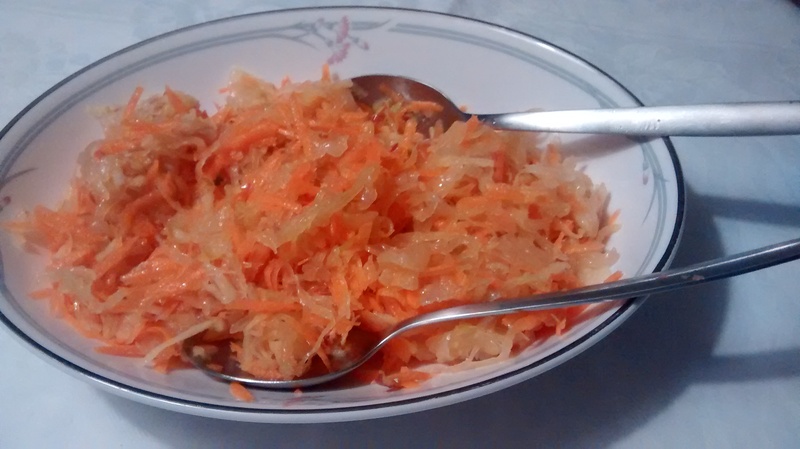 Prepare the sauerkraut and put it in a dish. 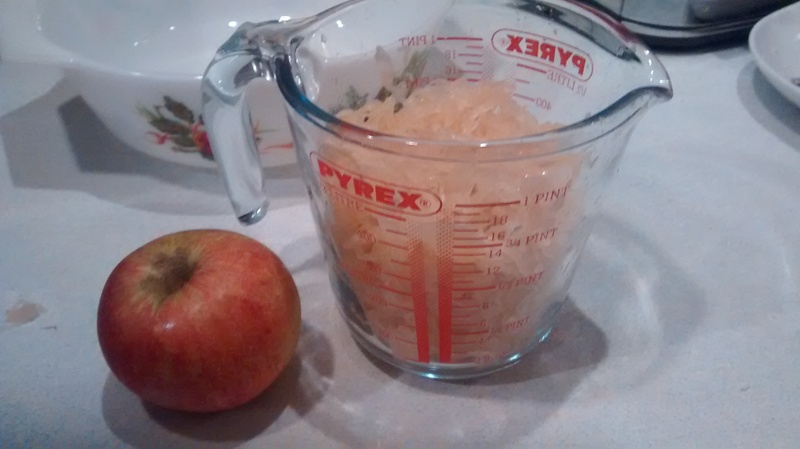 Grate the apple, skin and flesh using a coarse grater and add this to the sauerkraut. Mix the two together. Add the sunflower oil and sugar and mix well. Leave in a cool place for a couple of hours before serving. 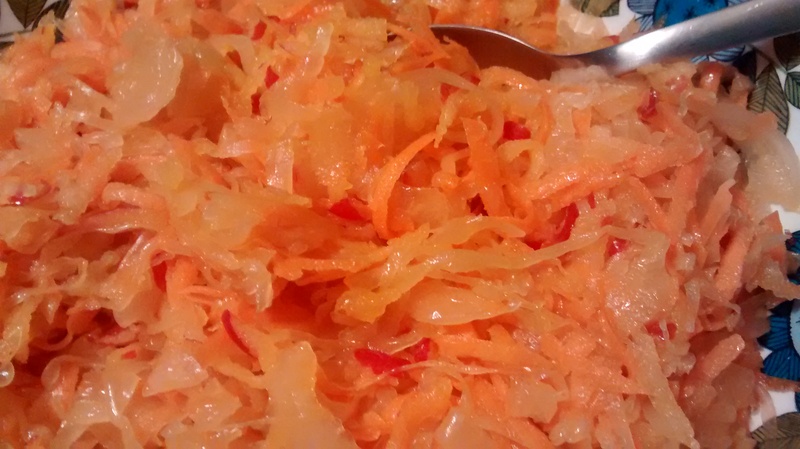 In the restaurant in the Polish Centre in Leeds they serve a wonderful sauerkraut and carrot salad – secret recipe of course! – the following is the nearest I can get to it. 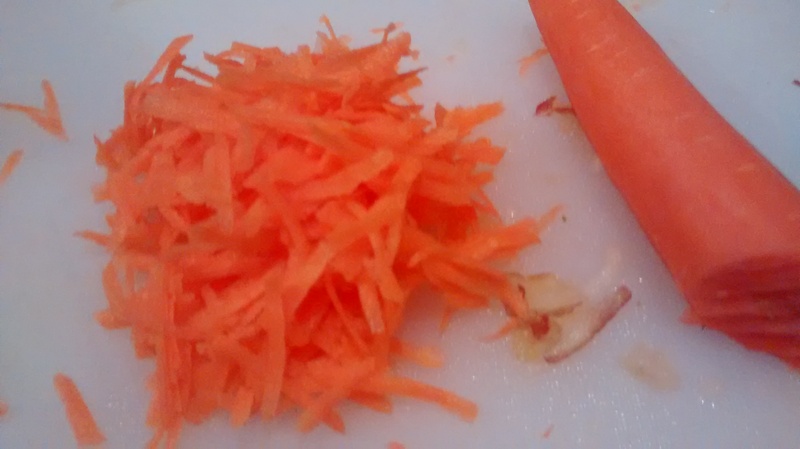 Peel and grate the carrot using a coarse grater. Grate the apple, skin and flesh, using a coarse grate. 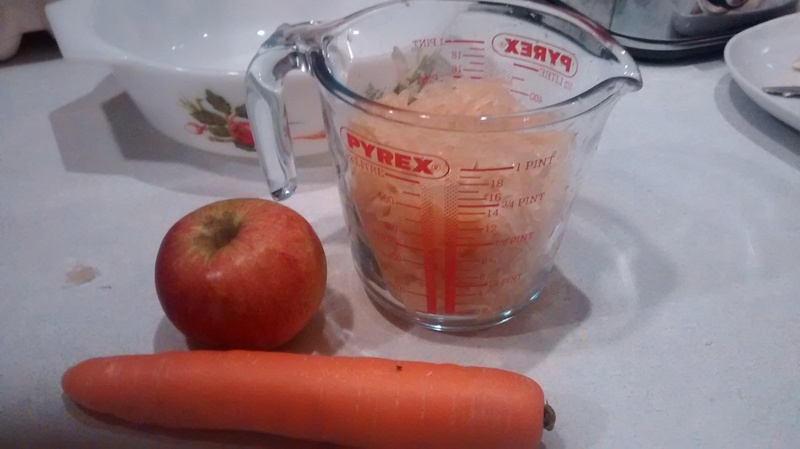 Add the grated carrot and the apple to the sauerkraut. 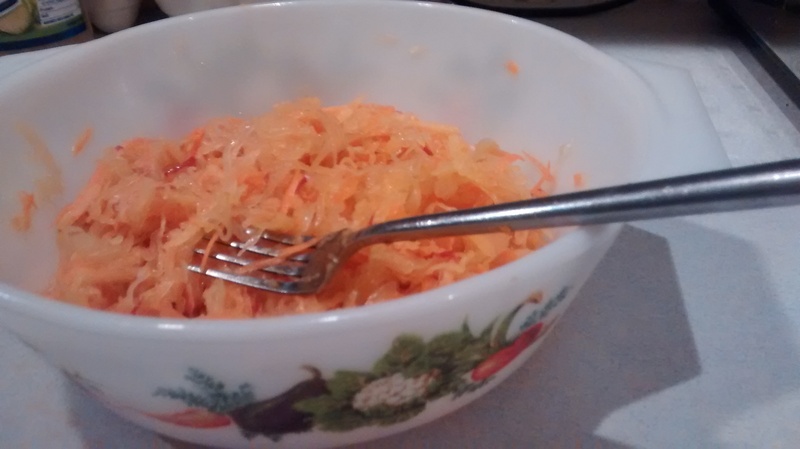 Once you have opened a jar of sauerkraut if you are not going to make something else with it in the next day or so you can portion it up and freeze it for later use. THanks for sharing! Will try this with carrots!